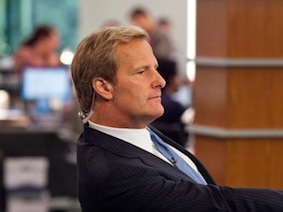 A pair of HBO newcomers, The Newsroom and Girls, made big showings Thursday in the 70th annual Golden Globes nominations. ABC's freshman drama Nashville also broke through with two acting nominations while NBC's Smash got a surprise nod as one of the five nominees in the "Best Television Series -- Comedy or Musical" category. Girls was the only other first-year series to make that list while Newsroom is the lone newcomer in the best drama series category. The Globes got very girly overall, with Girls' two nominations matching the total for Fox's New Girl while both fell one short of the HBO movie The Girl, which got three. Cable as usual dominated the nominees list, with 36 of the available 55 spots in 11 TV categories. But 14 of these were in the three "Miniseries or Made-for-TV Movie" slots, where the only broadcast network nominee is Bernard Cumberbatch for his title role performance in PBS' Sherlock. PBS also notched three nominations for its Season 2 of Downton Abbey. HBO had the most overall TV nominations with 17 while Season 2 of Homeland led arch rival Showtime's list of seven nominees after winning the last time as best drama series. AMC tallied just three nominations, with Breaking Bad making the cut as best drama series but Mad Men falling out of favor and receiving only a lone acting nod for series star Jon Hamm. Tina Fey and Amy Poehler, who will co-host host the Sunday, Jan. 13th prime-time ceremony on NBC, were each nominated as best actress in a television series -- comedy or musical. But their respective shows -- 30 Rock and Parks and Recreation -- are not among the five best series nominees. In fact, of the 10 actors and actresses nominated for their comedy performances, only two of them (Lena Dunham of Girls and Jim Parsons of CBS' The Big Bang Theory) had their series nominated as well. The secretive and smallish Hollywood Foreign Press Association annually makes the Golden Globes nominations in both television and feature films. For a complete nominee list, go here.